FOR Elizabeth Harrington, the secret to good liturgy is simple – good music, good preaching and a sense of being welcomed. 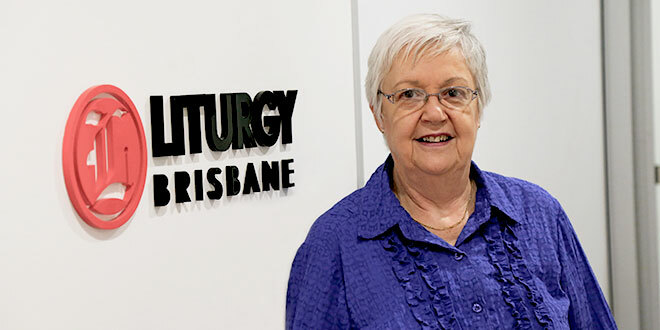 It’s not an answer she gives off the top of her head; she’s been pondering the question with a passion for more than two decades as education officer with Liturgy Brisbane (formerly the Liturgical Commission). She retired from the role recently after 23 years, utterly convinced of the value of the work she had done. “I just think good liturgy is so important for people’s faith life,” she said. “And they’ll always say, if you do a little survey, even with young people, they say music, good preaching and a sense of being welcomed – that makes good liturgy for them. “If somebody says g’day to them when they come, the homily’s short and to the point, and the music’s something they can sing, that’s alright. But there was a time Elizabeth had no idea what the word “liturgy” even meant. That was in the days before she became a Catholic. “How I got involved in liturgy way back – the day I was received into the Catholic Church, which was forty-one years ago, a lady from the parish came up to me and said, ‘Would you be interested in being on the liturgy committee?’,” she said. “And I said to this lady, who I later found out was called Dot, ‘Oh, oh, I don’t know. Let me go away and think about that’. “I hadn’t come across the word ‘liturgy’. It’s a sort of a Catholic word. I’d known about worship and praise and services and so on. had been sensing God was at work. She said Dot would’ve seen her coming to Mass at Sacred Heart, Rosalie, with Tim after they had been married. “I didn’t become a Catholic beforehand but I figured God was leading me somewhere because I’d become disengaged from the Presbyterian Church,” Elizabeth said. “When I went off to uni and teachers’ college and so on, I kept meeting all these Catholics and then I’d go off to Mass with them. Attending Mass with her friends, Elizabeth discovered “there really was something about the Catholic worship that appealed to me”. “I liked the liturgy, the pattern to it. After Elizabeth, a school teacher, had been with the liturgy committee for a while, parish priest Fr Denis Power asked her if she’d take on the role of part-time pastoral associate and she accepted. That was when she completed a three-month Institute of Pastoral Liturgy course. “And that really hooked me; I started studying liturgy and I really, really enjoyed it,” she said. Around that time, she had her first contact with the Liturgical Commission (now Liturgy Brisbane) when director Fr Tom Elich, who was the curate at Rosalie and the presider the day Elizabeth was accepted into the Church, invited her to join the editorial board of Liturgy News. She took that on as well when she was working full-time – divided between her pastoral role in the parish and teaching at Marist College, Rosalie. “I finished the Institute of Pastoral Liturgy course and was also doing some study then at Banyo but then this role at the Liturgical Commission came up,” she said. The religious sister who had been education officer at the commission had moved on and there were no suitable applicants to replace her so Fr Elich turned to Elizabeth. “I said, ‘Hmmm. Frankly, Tom, I like you as a person; I can’t imagine working with you, but I’ll take 12 months’ leave of absence from Cath Ed, and just give it a go. I’ll see how I go’,” she said. Elizabeth said the role had “combined my love of teaching with my heart for the liturgy, which I’d discovered I had”. “And it was nice to be teaching adults instead of … I loved the Marist Brothers boys but, I mean, it was nice working with adults who chose to be there rather than boys who really didn’t want to be there half the time,” the mother of three sons said. For Elizabeth, “having a heart for liturgy” is about an awareness of its vitality for the Church and faith. “Everyone wondered when the Second Vatican Council met, ‘What are they going to talk about first? Are they going to talk about the Church, or the bishops or so on?’,” she said. “And he said that’s really what the liturgy’s like,” she said. “Our role is out in the world; it’s not inside the church buildings. What’s kept Elizabeth going for more than two decades running countless workshops and presentations in parishes, around Australia and overseas, and writing hundreds of columns for The Catholic Leader is the people. “A few times I would’ve thought, ‘Oh, I don’t really need this’, because you get a lot of criticism as a liturgist,” she said. “I used to say when I was a teacher, every parent or everyone was an expert on schools (and teachers) because they’d been to school. “Well, of course, everyone’s an expert on liturgy because they go to Mass, and so if you try to put some things forward you’ll always get knocked down. “What keeps me going and what has kept me going is the wonderful, faithful, committed people out there in parishes who work on the liturgy week in week out. “They get knocked down, they don’t get much recognition and they certainly don’t get any pay. “The talented musicians who’ll play, turn up every week, the people who sing, the people who put their names forward to read, and of course the presiders – the priests do a great job, and it’s hard work for them too – that’s what keeps me going. “And when I do workshops, it’s just that engaging with those sort of people, and they’re always so grateful for anything you can do for them. “So that’s what’s kept me going, and knowing that this is God’s work.